Rowing, often referred to as crew in the United States, is a sport whose origins reach back to Ancient Egyptian times. It involves propelling a boat (racing shell) on water using oars. By pushing against the water with an oar, a force is generated to move the boat. The sport can be either recreational for enjoyment or fitness, or competitive, when athletes race against each other in boats. 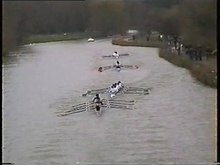 There are a number of different boat classes in which athletes compete, ranging from an individual shell (called a single scull) to an eight-person shell with a coxswain (called a coxed eight).